Kyu-Shiba-rikyu Gardens in Tokyo's Minato ward is a true Japanese garden built by a daimyo (feudal lord), an oasis in an urban area. This article will describe all the feature of this beautiful garden. Kyu-Shiba-rikyu Gardens is located in the midst of the high-rise buildings in Minato ward, Tokyo. Along with the Koishikawa Korakuen Gardens in Bunkyo ward, it is one of the few remaining gardens built in the Edo Period by a daimyo (feudal lord) still found in Tokyo. In 1678, Okubo Tadatomo, a daimyo, built his mansion and garden on this reclaimed land. At the time, the garden was called Rakujuen. Seawater was brought in to the garden pond from Tokyo Bay, so that viewers could enjoy the ebb and flow of the tide. Now, it has been turned into a freshwater pond. Okubo ruled the Odawara area in what is now Kanagawa prefecture, so Nebukawa-ishi, a volcanic rock which is abundant in that area, and Kuroboku-ishi, a rock from the Mt. Fuji area, are used in the garden. The garden has depth, and the visitors can also enjoy the seasonal flowers here, so much so that they sometimes forget that they are in an urban area. 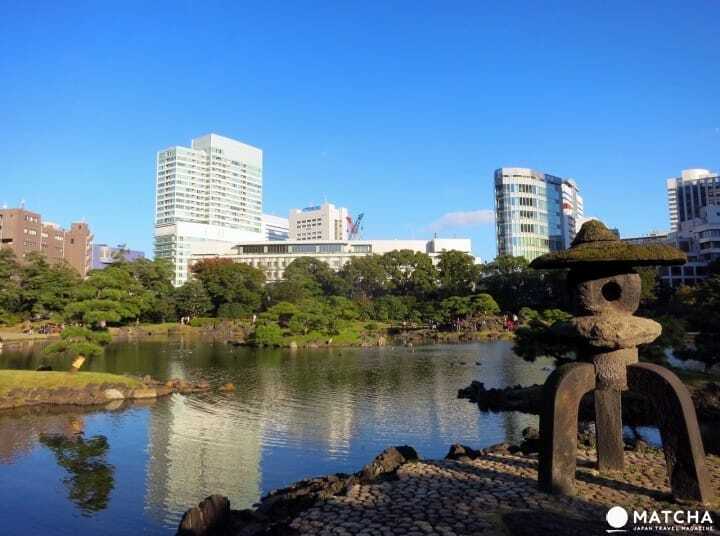 Kyu-Shiba-rikyu Gardens is open from 9:00 am to 5:00 pm (the entrance closes at 4:30 pm). ** Please note that the time may change during events and holiday seasons. The garden is closed from December 29th to January 1st. The admission fee is 150 yen for adults, and 70 yen for those over 65 years of age. Elementary school children or under can enter the garden for free. There is no admission fee on Midori no Hi (Greenery Day, May 4th) and Tomin no Hi (Tokyo Citizen's Day, October 1st).